LA CRUZ, Guanacaste — A half hour north of the Pocosol ranger station outside Santa Rosa National Park, park ranger Josué Sandoval turned the beat-up Toyota Land Cruiser off the Inter-American Highway and down a dirt road that flanked Guanacaste National Park. The sun baked in the December sky as Sandoval bounced in the front seat over washed-out roads, through a field with grass so high the road vanished altogether, across a river and up another hill. It’s hard to know what to look for when it’s not there. But after stepping out of the truck the damage came into view. A tangle of branches and leaves was all that was left of a stand of precious cocobolo hardwood trees that had stood there a month before. Backhoe tracks led up to the muddy clearing like the spent fuse of a bomb. “They left anything that was too small to sell,” Sandoval said, picking up one of the smaller logs to show off the plum-colored heart of the wood. The cocobolo bandits had been here. 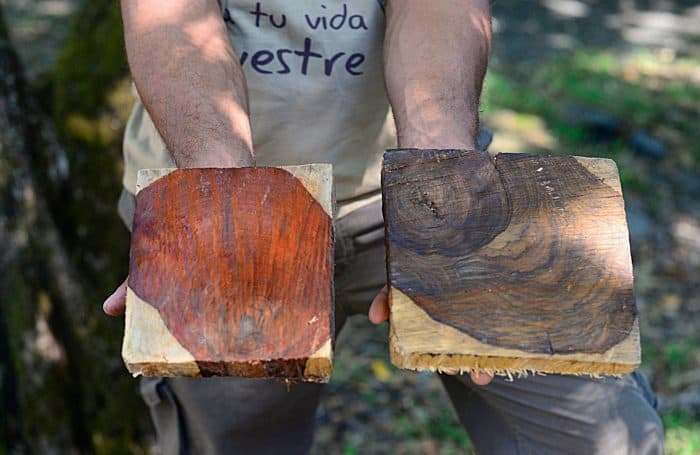 Since 2014, Costa Rica’s dry tropical forests have been under siege from loggers looking to cash in on skyrocketing demand for precious hardwoods, especially cocobolo (Dalbergia retusa), also known as tropical rosewood. The illegal logging of cocobolo and other precious hardwoods threatens Costa Rica’s famous but understaffed national parks as loggers look to protected areas as the last untapped source of valuable lumber for export. Cocobolo is indigenous to Central America. The tree can reach higher than 20 meters and prefers the dry northwestern Pacific province of Guanacaste. 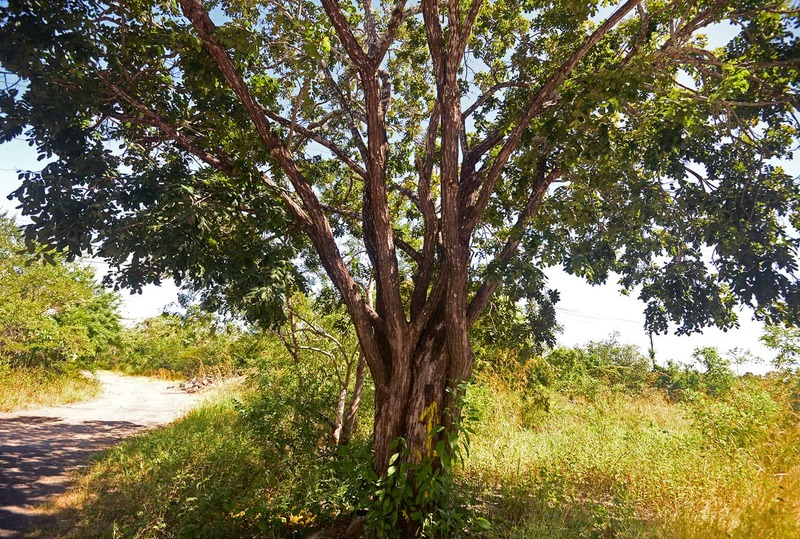 Compared to larger or more famous trees, like the Guanacaste or mahogany, it would be easy to drive past a cocobolo tree and not think twice about it. But under its plain appearance is its true value. The heart of the cocobolo tree ranges in color from pink to deep red to black. The dense, heavy wood is used mostly for furniture, floors, decorative crafts – such as bowls or fountain pens – and musical instruments, including a Doug Irwin guitar made with a cocobolo body played by the late Grateful Dead guitarist Jerry Garcia. Under Costa Rica’s Forestry Law, cutting down any tree requires permission from the government regardless if it is on private or public land, but the government occasionally grants permits to harvest cocobolo. Demand for the lumber and other tropical hardwoods from China and India, though, has outpaced the legal supply. High demand for the lumber has led to illegal logging and debate as to whether or not organized crime is involved in the practice, as well as the export of the wood. Between 2014 and 2015, rangers in the ACG area seized roughly 100,000 inches of cocobolo. “The illegal logging, trade and export of cocobolo is a serious problem of national interest,” Assistant Environmental Prosecutor José Pablo González said in an email. González said the environmental prosecutor is pursuing several cases but could not comment on them because they are ongoing investigations. 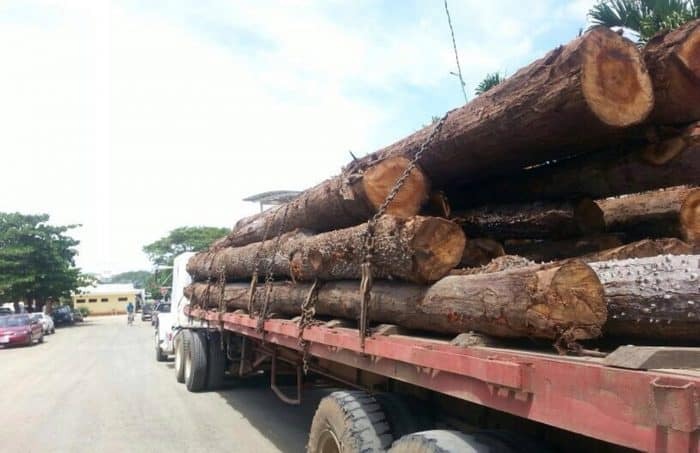 In an email to The Tico Times, the Judicial Investigation Police (OIJ) office in Liberia, the provincial capital of Guanacaste, denied that there was a criminal organization behind the illegal logging. Park rangers with whom The Tico Times spoke disagreed with the OIJ assessment. Raúl Acevedo, a park ranger with the Guanacaste Conservation Area (ACG) and member of the cocobolo working group, said the illegal harvest was well organized. “The characteristics of the operation are similar to how organized crime operates,” he said. Acevedo said that middlemen use word of mouth to find farms where there is commercial-grade cocobolo. Once the farm is located, the middlemen approach the land’s owner and offer upwards of several hundred dollars to cut down the trees. According to Acevedo, that same wood could be worth ten times as much in Asia. Once the trees are cut down, Acevedo described behaviors that sounded more like drug trafficking than logging. He said that officers have found trunks of cocobolo, typically cut down to just the reddish hearts, hidden under scrap metal, hay, oranges and among other lumber. Typically, an advance car will drive ahead of the truck carrying the cocobolo to alert the driver if there is a police checkpoint ahead. Park rangers also described lumber laundering whereby loggers find loopholes around the law to continue exporting cocobolo. One scheme involves getting a legal permit to log a certain amount of cocobolo and then continuing to cut down the trees until a ranger or police officer asks to see the permit. Another method involves buying cocobolo that has already been seized from the Prosecutor’s Office. The seized lumber is auctioned and sold to the same loggers Acevedo said allegedly cut the trees down in the first place. After the sale, the illegal lumber is suddenly legal. Assistant Environmental Prosecutor González said the lumber is likely exported through ports with false identification. Back at the Pocosol station, Sandoval showed off piles of cocobolo and cachimbo, another hardwood with a pink core, stacked haphazardly behind the ranger station. A truck seized by police and park rangers a few days before The Tico Times visited still had its illegal lumber load in the back. 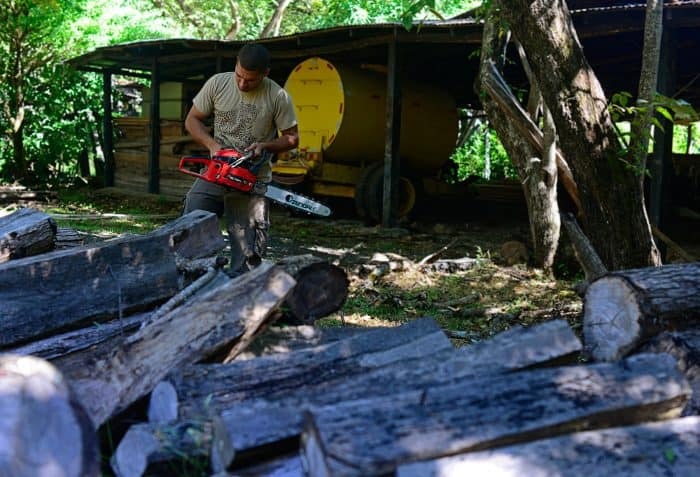 Planks and whole trunks of the precious wood seized from across the province — Cañas, Santa Cruz, Nicoya — were stacked like forgotten pyres, rotting in the shade. Sandoval went off to search for a chainsaw to show the different hues of the wood, but none of the two he found worked. Looking around the station it was not hard to see that the rangers lacked the basics — from manpower to gasoline for the beat up Land Cruiser. Outside the barracks where rangers slept the back seat of a car sat in front of a television as a makeshift living room. “We’re forgotten out here,” he said. The answer to the cocobolo crisis might end up being the same market forces that created the illicit demand in the first place. Acevedo said that after boom years in 2013 and 2014 for cocobolo, 2015 was relatively quiet. The OIJ office in Liberia said it received only two reported cases of illegal cocobolo logging last year. The Environment Ministry has been studying a possible moratorium on logging cocobolo but the drop in demand internationally might make the effort moot. Regardless if the lumber d’jour is cocobolo, teak, or another hardwood, illegal logging remains a serious concern for Costa Rica, a country that made its name internationally with an aggressive reforestation and conservation effort following decades of aggressive deforestation for lumber and cattle industries. Acevedo said that illegal logging in Guanacaste threatens not only the trees’ survival but the watersheds in the parched province. After a serious drought in 2015, protecting water sources by leaving trees and forests along streams and rivers is more important than ever, he said.